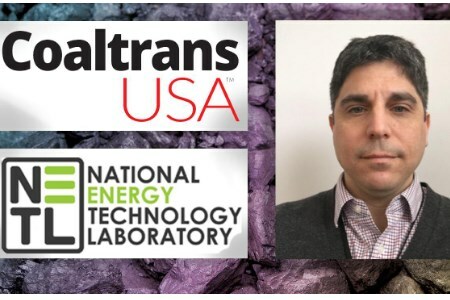 Christopher Matranga, a Research Scientist in the Materials and Manufacturing Division of NETL, is an event speaker at Coaltrans USA 2019 this week in Miami (Florida, USA) where coal producers, consumers, traders, supply chain and policy makers are learning about trends and innovations affecting the coal supply chain in America. Matranga’s current research develops processing methods for converting domestic coal into high performance carbons such as graphene, carbon fibre and composites. He also works on development of catalysts for CO2 utilisation and Fischer-Tropsch applications. For nearly 20 years, Coaltrans USA has been the official annual gathering for the entire coal supply chain in America and attracts more than 250 coal professionals from national and international energy companies. The conference is featuring discussions on key issues that can affect the coal supply chain such as the implications of coal and steel tariffs on export quantities of US coal; impacts of a reduction of demand of coal on production levels from US mines; how the industry’s downsizing and consolidation impact regional capacities; price points needed to sustain mining capacity; how the US can take advantage of strong export markets; and ways to assess the depletion rate of mines compared to capital investment for new mines. The event will also feature two new topics in 2019: one on metallurgical coal insights, and another focused on thermal coal. Joining Matranga on the event speakers list are representatives from Ramaco, Oremco Inc., the Massachusetts Institute of Technology, Oak Ridge National Laboratory, the Global CCS Institute, Deutsche Bank, the US Department of Energy, Southern Company, Thomson Reuters and others.